I have laboured diligently in sciences and languages, and forty years have passed since I first learned the alphabet. I have always been studious and for all but two of these forty years I have been in study. The date of 1214 is arrived at by assuming that the passage means that forty years have passed since he began his university studies. These began at the age of thirteen, so 53 from 1267 gives the date of 1214 as the year of his birth. There is, however, another interpretation. This is to accept as a literal fact that he first learned the alphabet in 1227. If so then perhaps he was born around 1222 but would Bacon claim to have been in study since the age of five? This would seem unlikely for the son of landowners of this period. Roger was not the oldest of his parent's sons so he would not have been expected to inherit the family estates and wealth. It is likely that his parents would have expected him to have become a priest which was the usual route for a son, other than the first, of a family in their position. Although there is no record of Roger's education before he entered Oxford University it is likely that he would have been taught Latin and arithmetic by the local priest to prepare him for university studies (where all teaching was carried out in Latin). At the age of thirteen he entered Oxford University, his father putting up the money for his board, subsistence, and tuition. Of course we must not think of Bacon's university course in terms of the three or four year university course of today. Entering university at the age of thirteen meant that the university was providing both what would be considered today as a secondary and tertiary education, so Bacon would have spent many years of study at Oxford. His initial studies covered the trivium of grammar, logic, and rhetoric. He then progressed to the quadrivium, studying geometry, arithmetic, music and astronomy. He received Master's Degree from the University of Oxford and remained there teaching until around 1241. The teachings of Aristotle had been banned at the University of Paris for several years on the grounds that Aristotle was not a Christian. However in the early 1240s Paris reintroduced the teachings of Aristotle into their courses. They looked to the young lecturer Bacon, who had become an expert on Aristotle at Oxford where his teachings formed a major part of the course material, to lecture at the University of Paris on Aristotle's ideas. He joined the Faculty of Arts in Paris, which was divided into four administrative units, three being French and one, which Bacon joined, being English. This was only an administrative set-up and in no way indicated the language of teaching which, like Oxford, was Latin. Students who find 9 a.m. lectures impossibly early in universities today should note that lectures in Paris in Bacon's time began at 6 a.m.
[Peregrinus] gains knowledge of matters of nature, medicine, and alchemy through experiment, and all that is in the heaven and in the earth beneath. ... Moreover, he has considered the experiments and the fortune-telling of the old witches, and their spells and those of all magicians. And so too the illusions and wiles of all conjurors; and this so that nothing may escape him which ought to be known, and that he may perceive how far to reprove all that is false and magical. Peregrinus later wrote a famous treatise on magnets while serving as an engineer in the army of Charles I of Anjou. His masterpiece was written while the army was besieging Lucera in Italy in August 1269 while on a crusade approved by the Pope. Bacon's interest in mathematics and natural philosophy, probably aroused by Peregrinus, took over his life in Oxford after he returned there in 1247. It became a passion into which he poured all his family's wealth. He bought books, equipment, instruments, and mathematical tables. These were all very expensive for all books were in manuscript and each volume had to be copied by hand. He was much influenced by the writings of Grosseteste and he embarked on a deep study of languages, mathematics, optics and sciences. So hard did he study that he had no time for friends or the university life around him. He was so fully occupied with his studies that those around him marvelled that his health stood up to the long hours he spent. Mathematics is the door and the key to the sciences. ... contrived or artificial experiments, casual everyday experience, reports of the experiences of other observers, the spiritual experience of divine illumination, and what I [Lindberg] call geometrical experiments. In De mirabile potestate artis et naturae, which is essentially a letter written around 1250, Bacon described his scientific ideas, in particular his ideas for mechanical devices and some of his optical achievements. Bacon visited Paris in 1251 but later left the University of Oxford and entered the Order of Friars Minor, the Franciscan Friary in Oxford. It is unclear exactly what his reasons were for this move. Certainly he was a devout Christian who believed that his scientific work would aid an understanding of the world, and so of God through understanding His creation. St Augustine had encouraged Christians to learn from and make Christian use of the teachings of pagan philosophers. Bacon strongly believed in this teaching by St Augustine and studied all the Greek and Arabic works he could lay his hands on. This was not the view of many in the Church, however, who believed that a study of the scriptures was the only path to knowledge and disapproved of the study of non-Christian philosophers. Joining the Franciscans, who had a tradition of scholarship, may have been a move to give Bacon some protection from those opposed to his views. It may simply be that by this time his enormous expenditure on scientific study had used all his family's funds, he was forced to find a means to provide his keep. Some historians suggest that the move was largely due to ill health, perhaps caused by over-work. They forced me with unspeakable violence to obey their will. For about 10 years Bacon had no personal contact with the outside world although he was able to correspond by letter. One of the few academic tasks he was able to do during this time was work on calendar reform. His plea to the Pope to reform the calendar was not listened to and when 300 years later the Church did reform the calendar along the lines suggested by Bacon, he received no credit for his early proposals. Bacon was also able to teach mathematics while in the Paris friary, so although it appears that the intention was to prevent him from undertaking research which the Church did not approve, life of a sort was still possible. 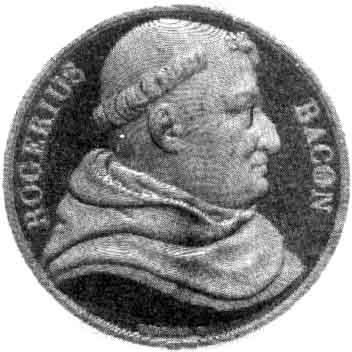 Bacon contacted Cardinal de Foulques in 1264 proposing to write a book on science which would be of benefit of the Church. There seemed to be some misunderstanding, for Cardinal de Foulques got the idea that the book was already written and asked to see it. Bacon saw this as his only chance to restart his scientific studies and be free from the Paris friary. However with no money, and by now his family in England were ruined through choosing the losing political side, he had little means to produce the required text. However, in 1265 Cardinal de Foulques became Pope Clement IV and Bacon now had the support of the Pope. He contacted the Pope who replied in a letter written on 22 June 1266 telling Bacon to write his work in secret so that his superiors would not know that he was breaking the rules of his Order. This seemed impossible to Bacon, so he approached his superiors showing them the Pope's request. He was allowed to proceed. This work also gives 42 ° for the maximum altitude of the rainbow, a more accurate value than any previously given and one which Bacon must have discovered by experiment. The article  is an excellent account of how Bacon's ideas on logical theory evolved during his career. From his early work he introduced innovations in semantic theory and in Opus maius he extended these ideas applying them to problems of theology and philosophy. The Opus maius was sent to the Pope by a courier John, who was Bacon's favourite pupil. We know that the manuscript reached Rome but Pope Clement IV died before seeing it and Bacon's chances of having his great project come to fruition vanished. Bacon believed that the Earth was a sphere and that one could sail round it. He estimated the distance to the stars coming up with the answer 130 million miles. Around 1278 Bacon was put in prison in the convent in Ancona in Italy by his fellow Franciscans, the charge being of suspected novelties in his teaching. Here friars who had views with which their superiors disagreed were put in solitary confinement and not allowed to speak even to their guards for fear their views would have influence. They were refused confession and denied absolution so, their superiors believed (and so did the imprisoned friars), they would go to hell for all eternity. A change in the Franciscan leadership in 1290, however, saw Raymond of Guafredi take control of the Order and following the teachings of love by St Francis, released the prisoners in Ancona. Although we have no explicit evidence that Bacon was among these men, it seems very likely that he was and he must have returned to England as soon as he could. From his writings it is clear that Bacon had always argued for what he believed and against those he believed to be wrong. He continued to state his views even after suffering the prison at Ancona for around 12 years. They were as aggressively stated in Compendium studii theologiae, his last writings of 1293, as at any time in his life.